As you probably know, the NBA was in China last week and this weekend as the Clippers and Heat played an exhibition game in Beijing last Thursday, and played another game in Shanghai on Sunday. 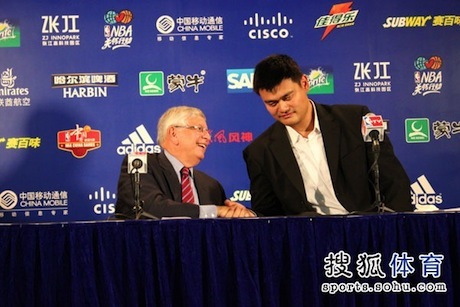 Before Sunday’s game in a press conference with NBA commissioner David Stern and Yao Ming, Stern announced the NBA will be supporting Yao’s bi-annual Foundation charity game in China starting the summer of 2013. [Note: this story has been updated to reflect a bi-annual game, not an annual one as previously reported]. This is great news since a game wasn’t played this summer because of the conflict with the Olympic games in London, and Yao’s career-ending injuries and retirement impacted plans for a game in 2011. The NBA also announced they have agreed to help players and coaches in the Chinese Basketball Association for the next 3 years. This past summer, the NBA announced it will work in China with the Yao Ming Foundation on a broad and comprehensive partnership to further basketball participation, develop youth basketball, promote cultural exchange and conduct social responsibility programs in China. In addition, Yao will collaborate with the league to launch basketball and social development programs for Chinese youth through NBA Cares and the Yao Foundation for communities in need. If you’re interested, here’s the video of the press conference where Stern and Yao talk about the benefits of the NBA working with Yao and basketball in China. Here are more photos from the press conference. This entry was posted on Tuesday, October 16th, 2012 at 2:31 pm	and is filed under Charity work, China. You can follow any responses to this entry through the RSS 2.0 feed.